What can I say about this book that will do it justice? My love for the Candymakers is something I cannot accurately describe. I realized last night when I finished this book, that though I always deem Wuthering Heights as my favorite book, my love for the Candymakers is unreachable. Nothing I have read makes me as happy as these two books do. 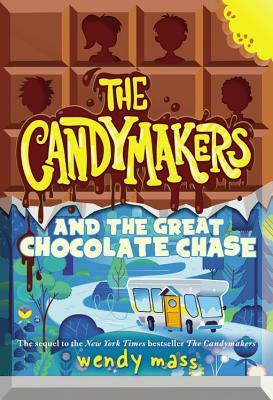 I read The Candymakers for the first time in 2011, and since then I have re-read it multiple times and listened to the audiobook numerous more. I was in disbelief when I saw that there was a second book. Book one ended in such a way as to leave a little bit of mystery, but I never thought that there would be a sequel six years later. I was ecstatic to have another entire book about the characters that I love so well, and I have realized that I would read a book about these characters even if it had no plot. But The Great Chocolate Chase did have a plot, and just like in the first book it was full of mysteries. There would be little bits of information tantalizingly withheld from you, forcing you to keep turning the pages. Every bit of the story line was interesting; there was no part that I just wanted to skip through, no slow parts that bored me. Every piece of the story line was intriguing. Great developments came about for our characters; they made some major discoveries that will affect their entire futures. I’m refraining from explaining myself further; the surprise will be so much greater if this remains a mystery. I love how this sequel followed in Book 1’s footsteps; the first section of the book is told form the point of view of each of the four children. It tells the first half of the story from each character’s point of view. I love this technique because when you see things from each person’s point of view, things just fall into place. The last half of the book is told from everyone’s point of view, which only took me a second to get used to. There were multiple times that this book made me laugh out loud and I just can’t recommend this series highly enough.